Intelligence Fusion Centers, Washington D.C.
Purpose and Scope: To provide first responders and investigators information on an emerging suicide method which may be difficult to recognise forensically as a suicide and has implications for responder safety. Helium is nearly undetectable in toxicological probes, and it can be difficult to recognize the signs of helium suicides. This is important information for officers investigating unexplained deaths. The use of hazardous gasses in suicide attempts poses a threat to first responders. 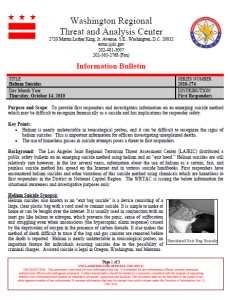 Background: The Los Angeles Joint Regional Terrorism Threat Assessment Center (LAJRIC) distributed a public safety bulletin on an emerging suicide method using helium and an “exit hood.” Helium suicides are still relatively rare however, in the last several years, information about the use of helium as a certain, fast, and painless suicide method has spread on the Internet and in various suicide handbooks. First responders have encountered helium suicides and other variations of this suicide method using chemicals which are hazardous to first responders in the District or National Capitol Region. The WRTAC is issuing the below information for situational awareness and investigative purposes only. Helium Suicide Synopsis Helium suicides also known as an “exit bag suicide” is a device consisting of a large, clear plastic bag with a cord used to commit suicide. It is simple to make at home or can be bought over the internet. It is usually used in conjunction with an inert gas like helium or nitrogen, which prevents the panic, sense of suffocation and struggling even when unconscious (the hypercapnic alarm response) caused by the deprivation of oxygen in the presence of carbon dioxide. It also makes the method of death difficult to trace if the bag and gas canister are removed before the death is reported. Helium is nearly undetectable in toxicological probes, an important feature for individuals assisting suicides due to the possibility of criminal charges. Assisted suicide is legal in Oregon, Washington, and Montana.